Situation/Background: Enteractive, Inc. bought Lyriq International in February 1996. The original intent of the acquisition of Lyriq was to first gain the development and sales/marketing expertise of the company, and second to gain the existing contents and brands. At the time of the acquisition, Lyriq was developing products at 10-20% of the typical budget within the entertainment software industry and in one-fifth of the time. This feat was achieved by the efforts and methods of Gary Skiba, my partner in this venture. Enteractive also wanted the benefits of the sales and marketing expertise that resulted in Lyriq being present in over 10,000 sales locations (thanks to Tom Fitzsimons and Jim Daly of Channel Sources, Inc.) and Lyriq’s distribution contracts that were negotiated by myself and Howard Luxenberg (Director of Marketing). As a result, the first year of my two-year post-acquisition employment contract was spent re-organizing and re-building the existing Enteractive, Inc. organization so that it could take advantage of the methodologies and other intellectual assets of Lyriq International. During this timeframe, the company introduced some award winning products including The Sacred Mirror of Kofun, Enchanted Tarot, Richie Sambora Interactive Guitar, and Jean-Michel Cousteau’s Cities Under The Sea (see product overview page for more information about these products). The other major effort in this first year was taking the newly combined companies under the Enteractive, Inc. name public. Our chairman Andrew Gyenes was a great businessman, and with GKN as our primary broker, we successfully executed the IPO bringing much-needed capital into the company. As we entered into the second year management, primary shareholders and market makers for Enteractive, Inc. came to the conclusion that it was in the companies best interest to redirect the company’s energies and capital into the emerging Internet marketplace. The costs of producing and marketing entertainment software were soaring, and correspondingly the margins and profits were dropping. The result of these discussions was Enteractive, Inc. acquiring the rights to launch USWeb offices in New York and the areas surrounding New York (Connecticut, Pennsylvania, Virginia, and Rhode Island). USWeb was a national organization providing web development and hosting services that was co-founded by my friend and colleague Toby Corey. I agreed to close down and sell the software business and to establish the Connecticut office of the new company – USWeb Cornerstone. USWeb Position Objectives: Determine optimum physical office location and build from the ground up a world-class Internet development and hosting services organization leveraging the USWeb brand and assets. Meet and exceed the first-year quota of $1.5M. Issues: Existing employees had signed on to develop entertainment software products, they needed to be motivated to stay and become energized about producing websites for corporate clients. By late 1996/early 1997, many agencies had already established themselves in the Connecticut region as premier web development organizations, and most target companies had either established in-house resources or relationships with one of the existing web development agencies. Established office in Stamford, CT.
All of the existing talent from the entertainment software group agreed to stay on and build the web development agency. This became the core development team for this new venture. Recruited top sales talent from within the Connecticut region with experience selling to Fortune 500 accounts headquartered in Connecticut. Developed and implemented solutions in the areas of media asset management, CRM, sales & marketing automation, real estate, e-commerce, project automation and communications, and human resources. Successfully penetrated key accounts both locally and nationally, including Loctite Corporation, Pfizer, Nine West, United Technologies, Petco, Hartford Insurance, The Danbury Mint, Starter, and World Golf Village. Exceeded the $1.5M first year sales quota. The USWeb Cornerstone Connecticut office was the only office in the company that was operating profitably and exceeding its sales targets. Turning Point Event: Upon reaching the end of my two-year post-acquisition contract, I entered into negotiations regarding staying on and continuing my role in building the new USWeb Cornerstone franchise. The Chairman and I could not come to an agreement on a new compensation package, so we amicably agreed to part ways. I resigned, and the Connecticut office was merged with the New York office. USWeb Cornerstone withdrew from the non-New York regions and consolidated its resources to meet the needs of the New York City market. The company re-organized again and was renamed Cornerstone Internet Solutions. The company struggled in supplying Internet development and hosting services profitably and purchased an organization with a B2B internet solution that targeted New York area food distribution. This Internet B2B play was well regarded by Wall Street, and the stock rose to $12/share from its low of $2/share. All the founders and original investors sold much of their holdings during this meteoric (really idiotic) rise in stock price that was just before the internet bubble burst. In late 2000 Internet stocks crashed and the Enteractive stock plummeted to $.10 share and was eventually delisted. Final Note: While my two years with Enteractive/USWeb Cornerstone were a bit disjointed due to the significant amount of change that was occurring both internal to the company and within the industry I have to say that they were also years filled with some great professional achievements. I had the pleasure to work with some of the best people both artistically and professionally in my career. Many of the products were questionable as to whether they should have been produced given the profit potential corresponding to small target audience size. However, they were produced magnificently by some of the best in the industry, which is why these products received critical acclaim. 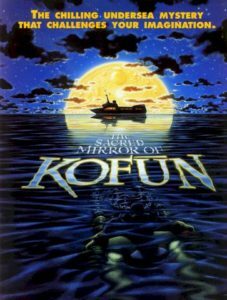 The marketing roll-out of the Sacred Mirror of Kofun was one of the best in the industry and accomplished everything that a company desires regarding garnering attention to the product and the company for a quality product. I will always remember the great events with people like Jean-Michel Cousteau, Richie Sambora, Terry Gilliam and the great accomplishments with colleagues such as Meg Tuttle, Karla Knickerbocker, Andrew Gyenes, and Ken Gruber to name too few that will last a lifetime.